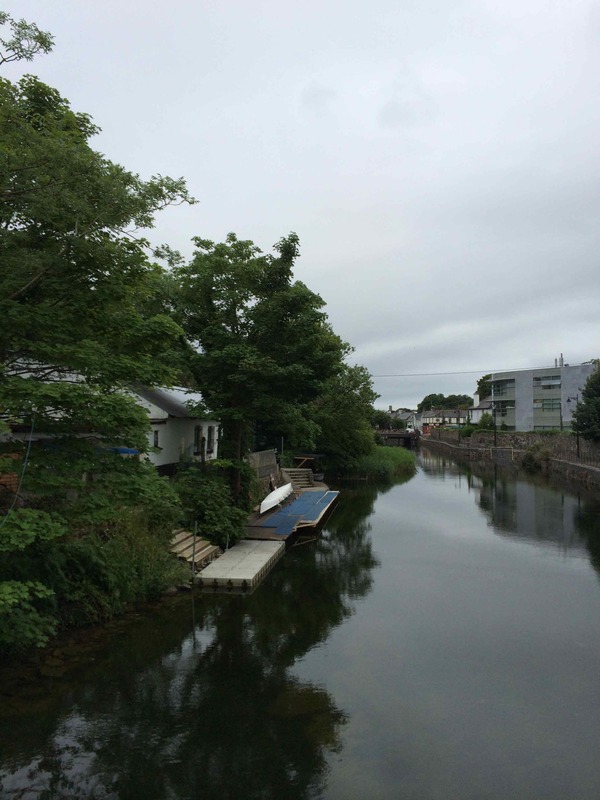 Galway is most intriguing—at least in the summer, which is the only time I have seen it—early in the morning. This is when trucks make their deliveries to the otherwise pedestrian streets, and when Galwegians, shopping bags on their arms, hurry to do the day’s purchases or, dressed in business clothing, head out to work. The first of the buskers begin to roll up on their bicycles, carting fiddles and speakers and all the rest of their street paraphernalia. At this time of the morning they all look groggy, although they will be lively enough in a couple of hours. Many of the breakfast cafes don’t even open until 9, so tourists tend to eat in their hotels, which I suppose is a safer bet if your sense of adventure doesn’t extend much past the beer gardens that line Quay Street. I come to Galway most summers for the Arts Festival, a two-week extravaganza of theatre, music and art that fills many city venues. The Arts Festival is bookended by the Galway Film Fleadh and the Galway Races; I haven’t gotten to the Film Fleadh and I would never go near the Races, which reportedly fill the town with hordes of drunken tourists. This year I saw two plays. 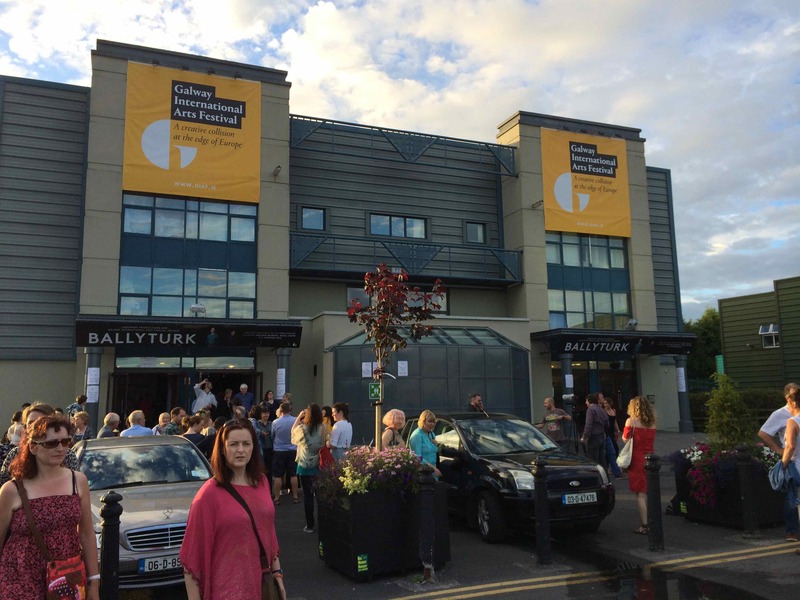 Ballyturk was the main draw, a world premiere by the Irish playwright Enda Walsh about, well, no one seems to know what it’s about, and Walsh isn’t talking. I saw it as a combination of Waiting for Godot, except that Godot shows up this time, and Walsh’s meditation on the lonely act of writing. Cillian Murphy is deservedly getting all the accolades (he is Walsh’s actor of choice since Disco Pigs), but the play really belongs to Mikel Murfi, a much lesser known actor than Murphy and the third actor, Stephen Rea. After the play I bought the script and read it through the next day when the play was fresh; I’m going to try to make this a habit. It seems like there is always one work that makes any effort at seeing art worthwhile. In this case, of the five galleries I visited between two evenings of theatre, Janet Cardiff’s The Forty Part Motet was it. Originally presented in 2001, this is a sound installation based on the English composer Thomas Tallis’s masterwork, No Other is My Hope. 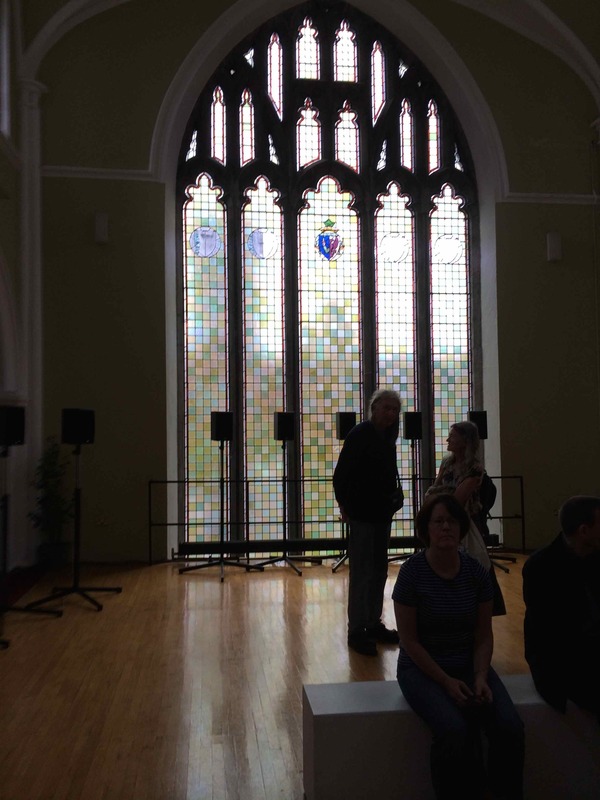 The installation was presented in the very church-like setting of National University of Ireland Galway’s lovely Aula Maxima, a large empty public room with soaring ceilings and an arched stained-glass window. The installation is forty speakers ranged in an oval, with various parts of the music coming through a constantly shifting configuration of the sound. As the eleven-minute work ebbs and flows, visitors are encouraged to walk around in order to capture both the full power and the individual pieces of the work. During the three-minute interval between the looped presentations, many people in the gallery talked, or left. But, hearing some ambient noise in the room, I went very close to the speakers; the artist had captured the sounds of a performance intermission, with rustling of programs, disjointed bits of conversation and musicians warming up their voices. It felt like a secret gift from the artist to those who were paying particular attention. I could have stayed all day. Today in the paper there is a brief article about a restaurant in Kerry that has put up a sign saying, No coaches and no loud Americans.A few times this summer people have asked if I am English. When I say I’m American they are surprised—you’re not loud, they tell me. 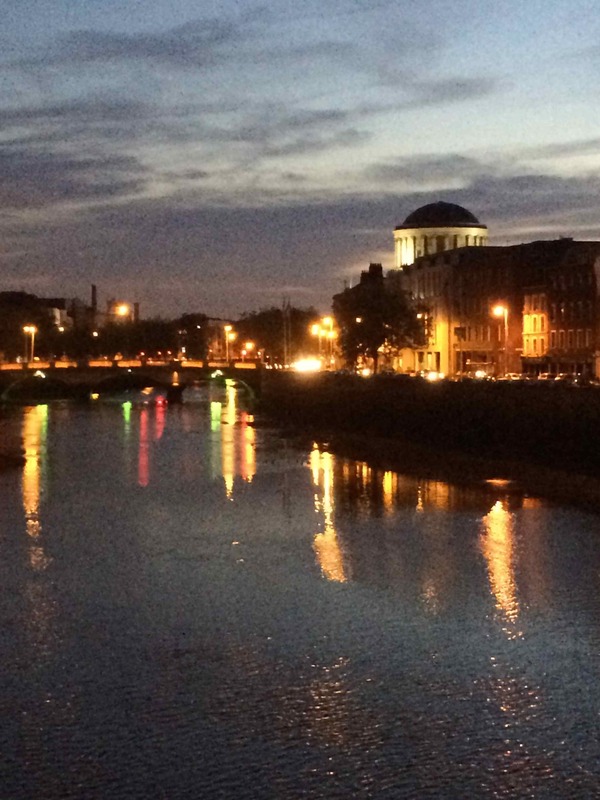 The Irish are not by and large quiet people. I wonder how loud Americans get here to warrant being turned away in restaurants? 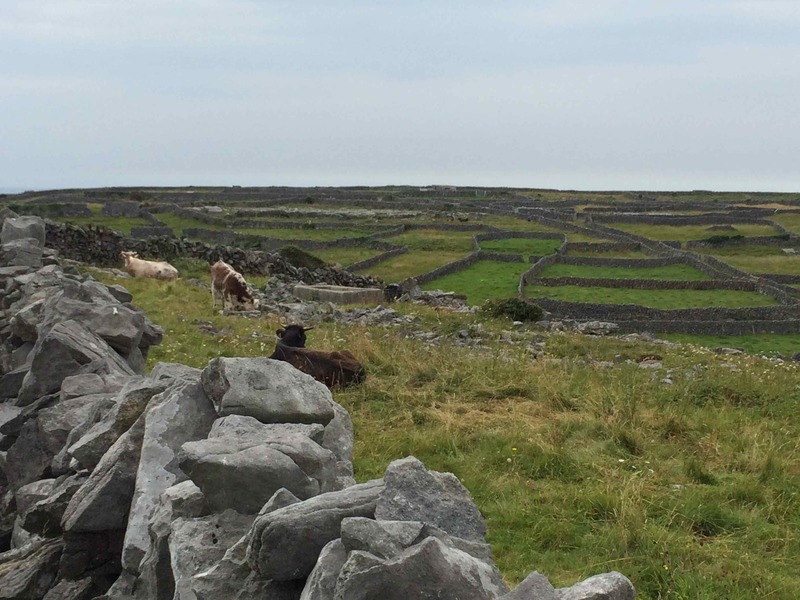 Even the Irish seem to have a collective romantic notion about life on the Aran Islands. After I visited and was on a road trip through very romantic Connemara, the tour guide at Patrick Pearse’s Cottage asked me if the houses on Inisheer were thatched cottages. No, I told him, they are the same Irish bungalows you see in every part of Ireland, stolid, symmetrical rectangles of stone and stucco with pitched tiled or, on the better ones, slate roofs. In fact, Inisheer’s 260 permanent residents seem to have stripped down to the essentials, an understandable reaction on a small dot of land that can be circled on foot in three or four hours. 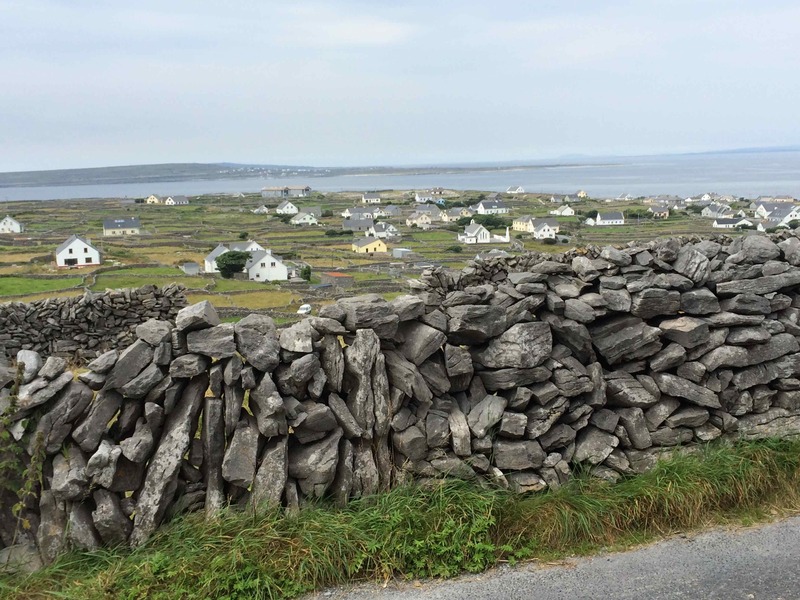 Inisheer is the smallest of the three Aran Islands, which fan out along the mid-west coast of Ireland. The next land a sailor would encounter would be the east coast of America. Tourists—and there are a lot of them in the summer—arrive by ferry or light plane. Nearly all of them are day trippers, coming off the 10:30 ferry just before lunch and leaving again by 4:30. On the high summer day I travelled there, most of the passengers were in sandals, shorts and tee shirts. Some of them carried coolers and a few had backpacks. Once we hit the open sea they were generally unprepared for the cold and headed down the stairs from the deck to the inside seating. When we arrived I was picked up by the couple in whose guest house I was staying. (Island residents have cars, which are brought over and left. There is a car park back at the main ferry pier back on the mainland where residents leave cars for use there.) Fisherman’s Cottage is at the far edge of the island on an isolated perch just above the boulder-strewn shore. Later Marie would tell me that she and John, her husband and partner in the guest house and their restaurant, built the cottage themselves. 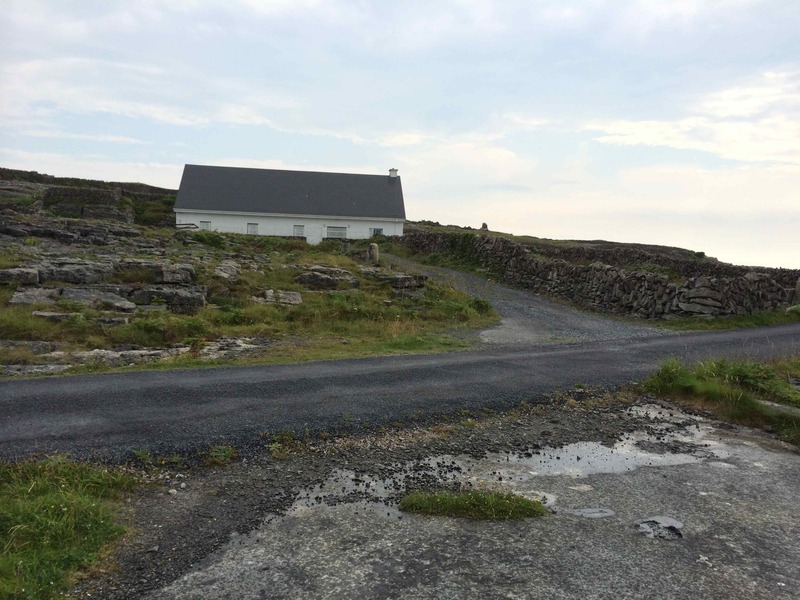 According to Marie (who is a blow-in from mainland Ireland, it is John who grew up on the island) everyone on Inisheer needs to be and is able to fend for themselves in this way, although I suspect that they are not all capable of building their own guest house. The guest house was far enough away from the pier and the small, protected beach that the day trippers never ambled down that way. Even the cyclists—bicycle rental is a main business on the island—didn’t seem to venture far from the tiny center, partly no doubt because the island is quite hilly and the roads and pathways are rough. I had already decided that the walking was far too good to pass up, so I didn’t bother with the bike, although my intention before I got there was to cycle around the island. The walking is heavenly, which is lucky because there is basically nothing else to do, and there are plenty of ruins along the way. There is the obligatory castle, this one quite late, sixteenth century, at the very top of the island. There is a nineteenth-century signal tower, now closed and fenced, and there is the eleventh-century Church of St. Gobhnait, a female saint who fled to the island while being pursued by an unnamed enemy. According to legend Gobhnait was a beekeeper who once foiled a cattle robber by unleashing her bees on him. The remains of her church are surprisingly intact (minus the roof, of course), and a stone altar inside holds contemporary ritual candles and a tiny vase of wildflowers. Most surprising on this island are the fields. The entire island is covered in these fields, which lay across it in a very irregular checkerboard that must look like a crossword puzzle designed by a drunken giant from those single-engine planes. These fields, called crofts here, are unimaginably small by American standards, or indeed by the standards of any agricultural area of this country. Many of them would be as small as 8 by 10 feet, and every single one is surrounded by thick, waist-high dry stone walls; in every case the croft entrance is blocked by a locked gate or occasionally a propped-up pallet. Even more puzzling than their presence is the fact that nearly every one of the crofts is empty. Some are mown, many are filled with nettles, a couple dozen or so have cattle in them (and even these are not very large and contain sometimes five or six cows). I saw only two sheep and a couple of horses (most of the horses, though, would be out hauling the traps that are the alternative to walking or biking; the drivers approach you somewhat luridly at the pier). In the hundreds of crofts I walked past I saw only one flower garden and a couple of potato patches. Earlier islanders would have cultivated potatoes and perhaps other crops and kept pigs, which were moved to market in currachs, traditional skin-covered canoes. During a lunch of the first of the mackerel for the season, I read in the Aran Islands book I bought at the craft shop that these crofts were painstakingly made by finding clay and lime deposits on the island, then spreading them over the rocky surface of the land and laying seaweed on the top. Eventually the islanders were able to eke out a living by farming the resulting thin topsoil. 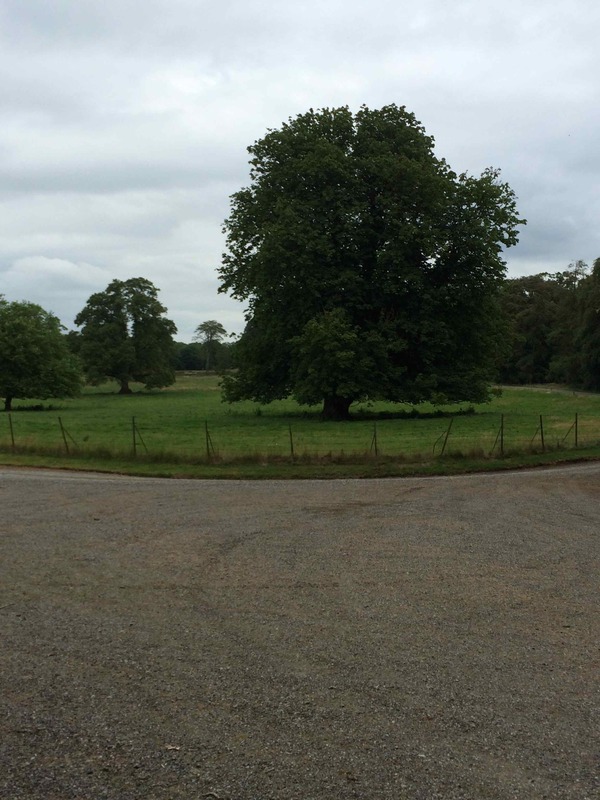 It would make sense to think that the crofts might have been large once, divided into these almost absurdly minuscule plots by successive generations of families as happened all over rural Ireland, but Marie says that is not what happened. Rather, the difficulty of developing the topsoil meant that each croft would be small, and that same difficulty (and no doubt the fact that up to 1,000 day trippers might descend on the island on summer weekends) keeps the islanders protective of their plots. At the guest house I found a copy of Synge’s memoir of his time in the Arans. I stretched out in the empty lounge and began reading, quickly finding myself completely engulfed in this fine, fine writing. I have never come so close to stealing a book, but in the end I put it back with great reluctance; I would have to wait until I got back home and could buy a copy and finish Synge’s simple, noble story. 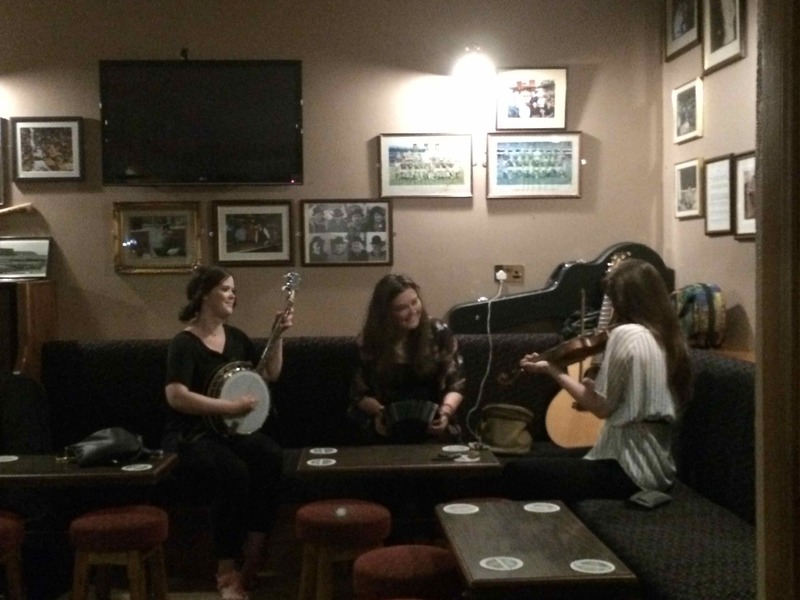 In the evening I ate dinner (mackerel again, and Irish lamb) with a Welsh woman names Bronwyn (of course) and then we went to a trad session with three young women as the musicians. Then back in the dark to the little guest house. “I’ve never seen anything like this.” When an Irish person says that, you need to take the rain seriously. When I left the gate lodge, the weather was gorgeous. I even went back into the house to change into sandals, thinking my flats would be too warm. By the time I got into Edenderry, less than 10 minutes later, the rain was coming down so hard that I could barely see the turn, and when I made the turn onto the edge road past Dunnes’ Store I couldn’t make out the curb. As I drove the roundabout and started up the hill to the main street I feared I might hydroplane through the deepening puddles. The Irish have many phrases for rain and weather: the day is soft, the day is close, the weather is unsettled (most frequently this is the case), the weather is showery, there are outbursts of shower, there will be sunny spells, it will be mainly dry, there will be periods of thundery showers. In heavy rain people say the rain is bucketing down. This rain was far beyond bucketing. It was torrential. It was so heavy that when I arrived at my friends, I phoned them and we decided I should wait in the car for five minutes to see if it let up. When it didn’t I made a run for it across no more than ten feet of sidewalk, covered by an umbrella. Even so, my sandals were sopping and my pants legs were wet nearly to the knee. As is the custom in Ireland we sat down immediately for dinner. Four hours and many bottles of wine later the six of us were still at the table, wrapped in the warmth of fish soup and the comfort of good friends, protected from the spates of downpour and the occasional streak of lightning. When we finally left to head home in the now dry evening, the town was eerily quite, the usual ranks of smokers outside the pubs nowhere in evidence. I drove past the chipper, the busiest spot on a weekend night, and although the neon lights spelling out Macari’s were bright there was a lone person inside waiting for his order. On the way home I didn’t encounter a single car, highly unusual even late on a Saturday night. When I was nearly back at Ballindoolin a hedgehog emerged from the woods and shuffled across the road in front of me. 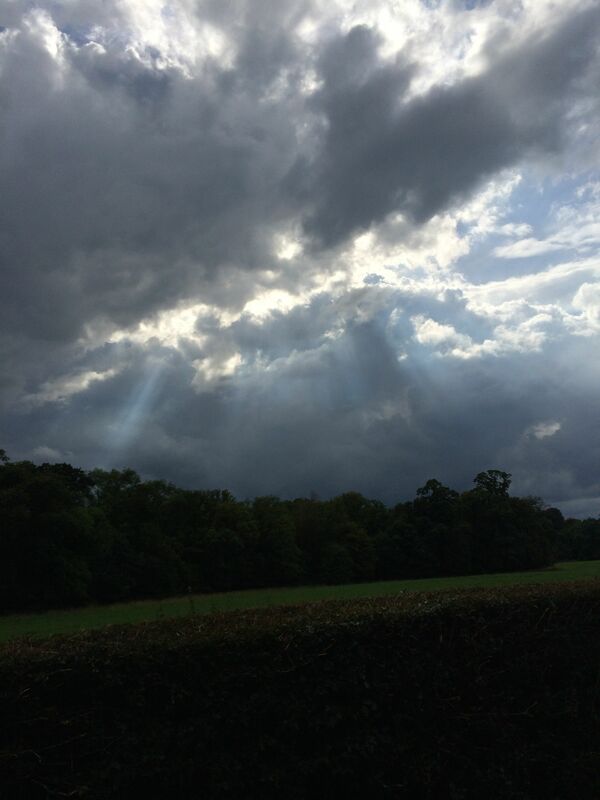 Back home, the gate lodge felt welcoming for a change, set against the black, black night. So evidently the Minister of something or other and his cronies, still in complete denial about why Garth didn’t show up to do three concerts and thus practice triage on which 160,000 ticket holders wouldn’t get to go, have decided to throw a Western Weekend in Dublin. 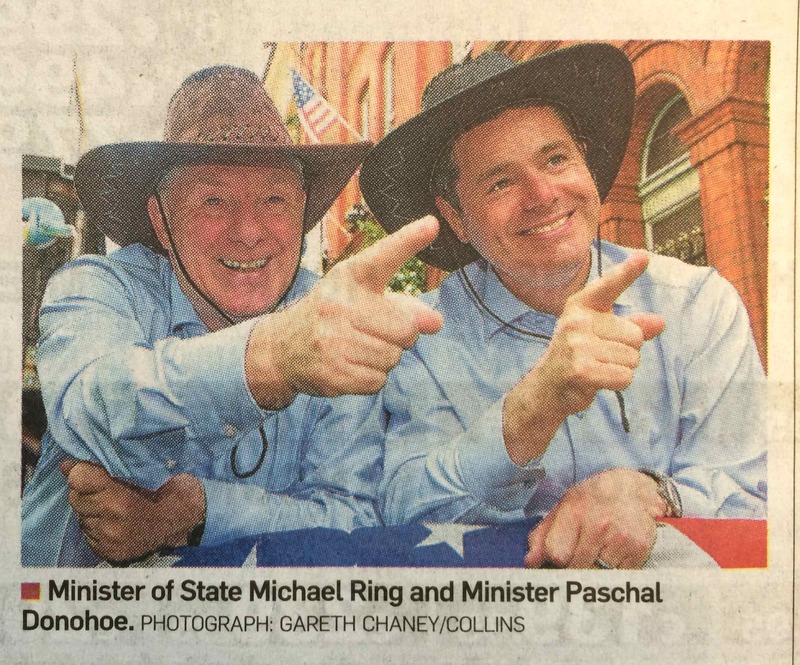 I’m sure that gingham bunting, bales of hay, square dance lessons and the Minister himself greeting people in a cowboy hat will more than make up for the lack of music in Croke Park. Yee haw! 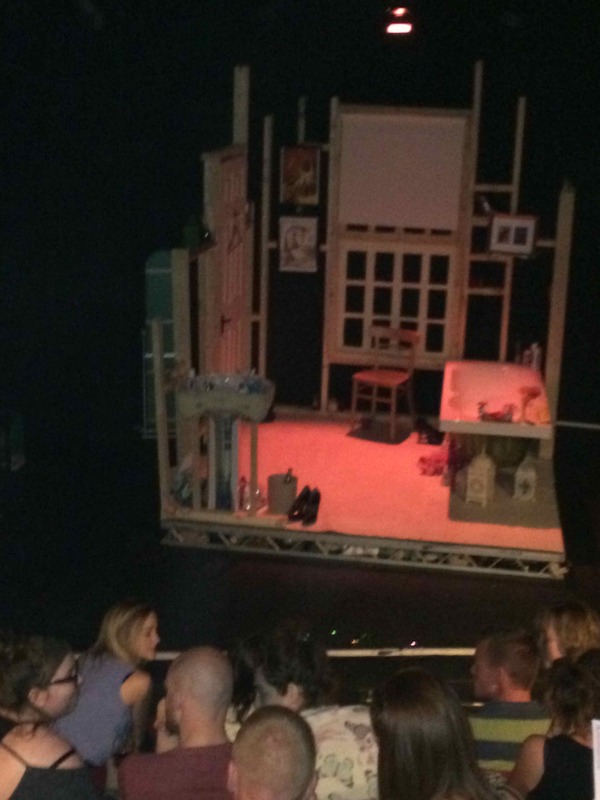 After another day at the National Library, I met friends for a date at the New Theatre, a black box in Temple Bar devoted to plays with a leftist political bent. The theatre is inside a bookstore, now sadly depleted, that in its glory days was filled with books extolling Marxism, Communism and Irish republican history. The story is that a devoted Communist who nonetheless managed to make a fortune somewhere underwrites the whole enterprise. I have seen several performances there, some extremely well done. The play we saw last night was Low Level Panic, which despite attempts at updating by including iPhones and social media, remained a piece of period feminism straight out of the seventies (even though it was written in the 80s). The entire action took place in the shared bathroom of three young women obsessed with their bodies in one way or another. The bathroom scenario (we were mercifully spared the loo) allowed the women to strip down to skivvies, or nothing in one case, over and over like a bit of performance art in LA during the height of second-wave feminism’s obsession with the female body. The three women rued their fat, prissily suggested OCD-type fussiness a la Maggie Smith in A Private Function and wailed about existential questions of being and nothingness, sometimes, alas, to guitar accompaniment. Ten men in black lurked around the edges of the set, occasionally breaking into the action but mostly witnessing. This obvious reference to the male gaze was undermined by the metrosexual look of the men, who seemed more like respectful servants than menacing presences. Three little girls with Rosetti hair appeared from time to time in a needless attempt to suggest the earlier innocence of the three women, who were already nothing if not babes in the woods, or in this case the bathroom, their strong language notwithstanding. Afterward we went across the street to the Clarence Hotel, which is owned by U2, who bought it to restore it to its former Edwardian glory. The restoration leaves the place dark, chilly and very masculine, but we had a nice cup of tea in one of the reception rooms before heading back out into the warm Dublin night. Well, Garth has packed it in. While the government dithered away, not reaching any solution and re-offering the same silly compromises—three concerts now, two in October, or back to the matinees, or why not settle for three—the singer finally made a definitive move. The moment he did the entire country seemed to turn on him, calling his demands blackmail, sputtering about how he has walked away from his fans. Suddenly the country is clear of blame and free of conscience. Must be nice. More residue from this debacle: Turns out that the infamous Brian, he of the injunction, was backed by the Ulster Volunteer Force, a Unionist organization from Northern Ireland that despises the GAA and looks for any way to crush its momentum. Brian, in fact, doesn’t even live in Croke Park. In addition to the UVF paying all legal fees, some unnamed person from Cork paid Brian €15,000 to take up the lawsuit. All of this, Garth, the UVF, the Mexican Ambassador, the White House, Brian, the luckless Minister of whatever he minsters to in the government, the Prime Minister, the government itself, the wags with the wicked commentary, all of this rolled on for nearly two weeks of primetime news. I doubt Jon Stewart himself could have woven such a pointedly absurd set of circumstances. 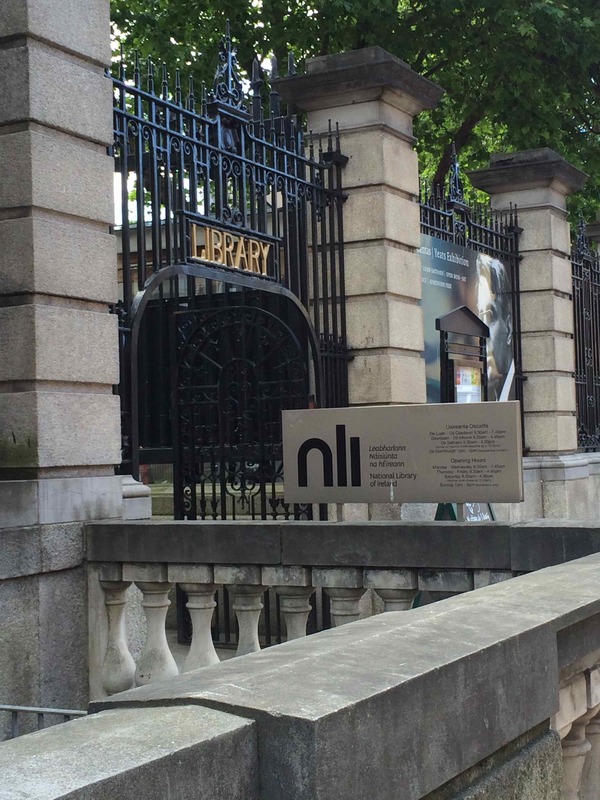 I spent the day yesterday in the National Library of Ireland, so happy to be back in research mode. My first stop was Special Collections, an unassuming room that reminded me for some reason of Stanford, although needless to say Stanford’s Special Collections is far grander. My interests here were the Yeats sisters, or more specifically Elizabeth (Lolly), who founded the Cuala Press, Ireland’s first private press, in 1902. When I looked up from my work I realized that there were nine men and me in the room, a situation that could be anomalous but that wasn’t entirely surprising. In the main reading room the gender balance was better. 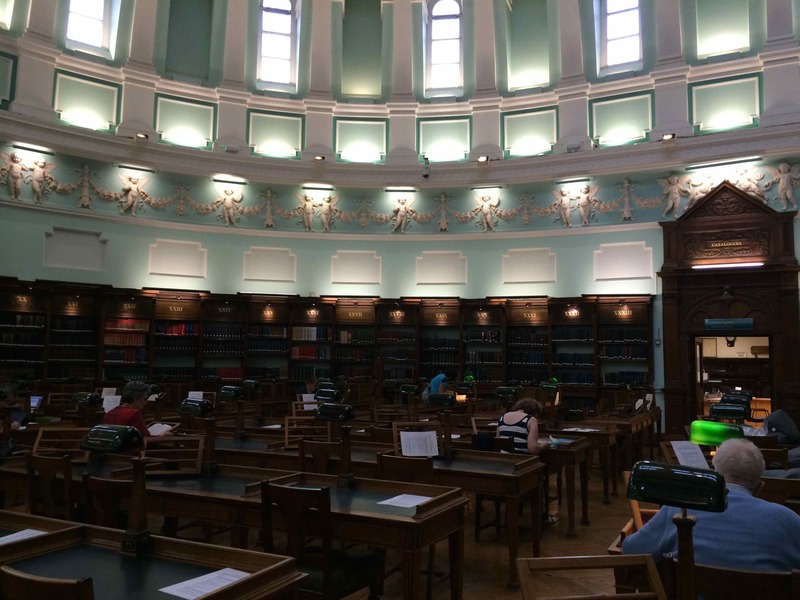 This room has retained its traditional character, reminiscent of the old round reading room in the British Library right down to the desk lamps and the wooden book stands on the researchers’ desks. This room is in fact 3/4 round, with a flattened space at one end and a soaring, pedimented ceiling. Cherubs overlook our endeavors, their white plaster standing out in sharp relief against the two-tone sea-glass paint of the panels. A highly satisfying place to work. On the drive home in the gathering dark I was trying to remember the libraries in which I have conducted research. The local ones, Stanford, the Bancroft, the Gleason at USF, Mills of course, CSU East Bay when it was still called Hayward, The Book Club of California, the California Historical Society (not enough there, I’m afraid). UCLA Special Collections, Otis College of Art & Design, the Getty, the Newberry Library and the Art Institute in Chicago, New York Public Library, Harvard. The American Antiquarian Society, still my favorite place to work. The British Library (both old and new), the V&A, the Tate Library, the Bodleian at Oxford, where they sent me down to the basement newspaper stacks with a flashlight, a map of the exits and a wave of the hand that meant, good luck—a terrifying place in which you fully expect to come across the bones of a poor academic who got hopelessly lost in the catacombs and was utterly forgotten by the library staff. A couple of small libraries in Italy whose names I have forgotten, another in The Hague. Probably others, although all I can think of now are the places I haven’t worked (Trinity College, Cambridge, anyplace in Paris or Germany). I suppose I love these places for their familiar environments, even though they are spread out geographically and very different on the surface. 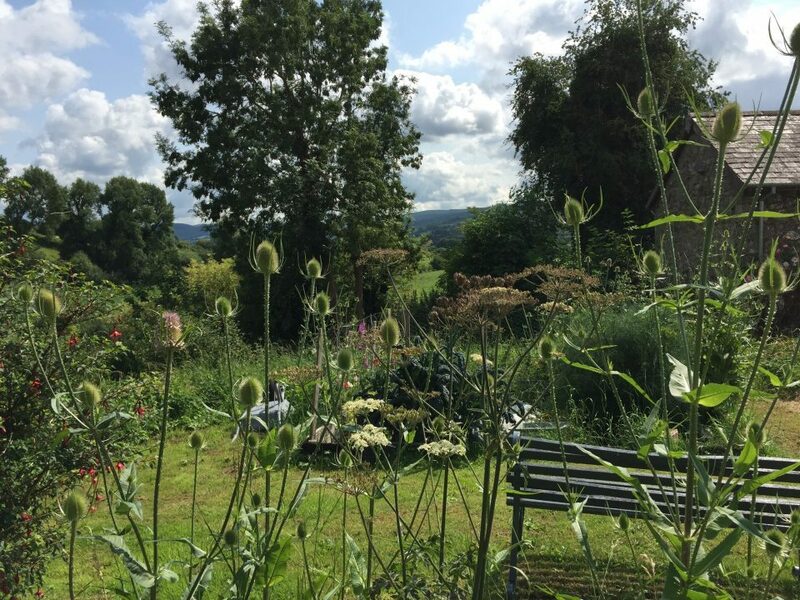 It’s a space in which I know how to operate, so there is a comfort to them once I learn to navigate their individual eccentricities, but there is also the excitement of finding the very bit of research that confirms or shifts an idea I was pursuing. There is the material evidence—the thickness of the paper, the quality of the printing, the typeface, the images, the hand-corrected text, the marginalia, the name inscribed on the flyleaf, the bits that are missing. And there is the permission to get absolutely lost in the minutiae of it all, the records and the stories and the reportage and the authority of all those manuscripts, all those letters, all those printed books and drawings and miraculously saved bits of paper that, when gathered, fill out a story that is otherwise lost to us forever but is still and always open to interpretation. Quick, can you name a Garth Brooks song? Even one? Neither can I. But evidently 400.000 people on this very small island dropped everything a few months ago and stood in line overnight! (or was it two nights? or a week?) with the rain bucketing down! (or was it snow falling in great drifts? or both?) to get tickets to his concert. So many tickets that one concert turned to three turned to four turned to five. Oh, whoops. Did anyone remember to get a permit? Well, sort of. The promoters did what promoters evindetly always do, sell the tickets first, then ask if it is okay. After all, the tickets always say, Subject to License, right? Evidently someone named Brian, who lives in the Croke Park neighborhood, was fed up with not being able to get out of his driveway on concert evenings, and the free tickets (because clearly the entire Irish population along with half of Europe wants to attend a Garth Brooks concert, right?) the €500,000 that would go to the neighborhood (€500,000!) and various other incentives weren’t enough to dissuade him from filing an injunction. Brian of course wasn’t alone. About 300 people live near the stadium and they were miffed that, after having held their collective noses (or ears) through three concerts by One Direction in May they were now expecting to brave the blocked driveways, the drunks urinating in their front gardens and the ambient noise from the stadium for five more evenings. The neighbors have a point: the Gaelic Athletic Association, which runs Croke Park, promised that they would be subject to no more than three ‘non-sporting events’ in any given year. But wait! €500,000. That would buy the neighborhood one heck of a playground. So maybe now we (aka The Neighbors) want the three concerts originally scheduled, but not the two extra concerts so carelessly tacked on to the original number. Hmmm. What do the Garth Brooks people say? Well, they say, uh uh. It’s all (five concerts) or nothing (as in zero). Is this blackmail or is this Garth (we call him Garth now because, well, he loves the Irish so much, even the honorary ones) being sympathetic to the poor beleaguered fans who bought tickets for the two additional concerts (including an ex-pat from New Zealand whose sacrifice—a trip back home and no Garth Brooks concert to show for it) and now would have to sleep in their non-refundable hotel rooms in Temple Bar without even a concert to attend beforehand. As the story grew, and grew, Garth Brooks and his comeback tour began to look more important than the second coming of the Beatles, even if it included the dead ones. Fans were gutted. Gutted! Pope Francis himself couldn’t have caused more consternation if he had scheduled a mass in Croke Park, then bailed because, well, he feared the Irish were a little too angry about certain lapses in their priesthood. As the week wore on, and on (and on) the Garth Brooks story continued to occupy more air time than the cabinet reshuffle, the state of the Israeli occupation of Gaza and the World Cup combined. The Irish Minister in charge of this mess, having stated that his initial decision to limit the concerts to three (or maybe four) was irrevocable, put forth more and more arcane and clueless fixes for the mess. Garth could do his five concerts with the promise that Croke Park would hold no concerts in 2015. Or for two years. Or ever. Garth could do the three concerts, then come back a couple of years later (!) and finish them off, as if the man just showed up on the stage with a guitar and a mike and sang for a couple of hours. Or another brilliant idea! Garth could do two matinees and three evening concerts in three days. So wouldn’t this plan put 160,000 people on the Croke Park streets on the matinee days, not to mention needing double the hotel space, food, parking, beer? No matter, GB himself, in one of the more reasoned arguments produced so far, nixed the idea, as the show is designed for night viewing. Garth finally held a press conference in Nashville, ostensibly to announce his world comeback tour, but in reality he used the time to chide the Irish government and bureaucracy, saying finally that he would swim, crawl or otherwise demean himself to the Prime Minister (the Prime Minister!) to resolve this issue so that he could just sing for his fans. Well, maybe sing and show them a monster show using the largest video screen in the known world and several million dollars worth of pyrotechnics (although possibly not literal ones?) that were even as he speaks making their way to Ireland by ship. I’m not sure how the promise of spectacle beyond anything Ireland has ever seen will mollify Brian and his neighbors, but never mind, the concerts are off (right?) anyway. Meanwhile, the Prime Minister hasn’t exactly indicated he wouldn’t get involved, but it doesn’t matter because, wait for it, the Mexican Ambassador has offered to mediate, so all should be well. But some fans, or was it the hapless Minister who made the original, irrevocable, decision not to allow five concerts, contacted the White House (the White House! ), evidently based on the understanding that O’Bama, having visited Moneygall a few years ago to check out his distant relatives, might now step up to resolve this international crisis. Obama (back to losing the apostrophe now that he has clearly repudiated his Irishness) declined to intervene, alas, leading one wag on RTE 1, the national radio station, to say that at least we know that the crisis would not be resolved by drone strikes. Now well over a week into this debacle and something like two weeks away from the concerts there has been no resolution, and the soap opera just goes on and on. And on. Is on the grounds of my friend Grattan’s amazing house. He knows it is the second largest chestnut tree because someone who checks on these things came with a ladder and a measuring stick. Grattan is disappointed that it isn’t the first.